The 3-12x44 Kaspa Dark Earth Tactical Riflescope from Weaver features a TB-X ballistic reticle, fully multicoated optical path and weather-sealed housing. Configured with an illuminated Enhanced Mil-Dot reticle (EMDR), this 3-12x Kaspa Tactical scope is equipped for close-range targets as well as more distant shots requiring range estimation and bullet drop compensation. Weaver's EMDR pattern has 0.1 mil hollow mil-dots and hash marks at 1/2 MOA increments. Uncapped windage and elevation turrets are capable of impact point correction in 1/4 MOA increments in addition to reset-to-zero functionality. A dedicated turret enables the shooter to select the illumination setting suited to their ambient lighting conditions, allowing the Kaspa Dark Earth Tactical scope's aiming point to remain visible in twilight or daylight. 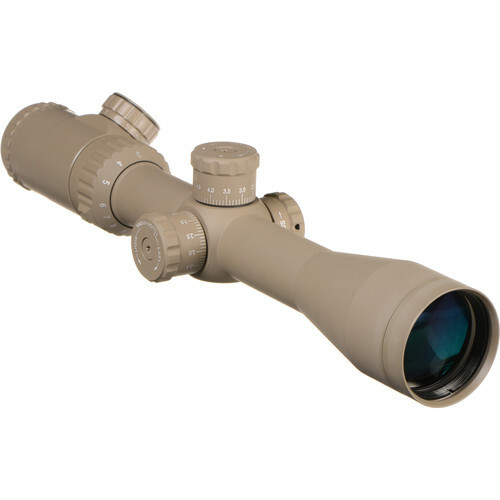 Box Dimensions (LxWxH) 16.1 x 4.1 x 3.3"
3-12x44 Kaspa Dark Earth Tactical Riflescope (EMDR) is rated 4.0 out of 5 by 1. Rated 4 out of 5 by Hankbrass from Ok Adjustments are close. Focus is a little touchy. Love the fine crosshairs!